Daniel Paul Bard (born June 25, 1985) is an American former professional baseball pitcher. He played for the Boston Red Sox from 2009 to 2013. At the midpoint of the 2004 season, Baseball America named Danny Bard the top freshman pitcher in the U.S. and gave him Freshman All-America honors. For the entire season, Bard was named to Baseball America's All-Freshman second team and was named as Freshman All-America by Collegiate Baseball. He was Atlantic Coast Conference (ACC) Freshman of the Year and earned first-team all-conference honors. In 16 games pitched, Bard was 8–4 with a 3.88 ERA; his eight wins tied the University of North Carolina at Chapel Hill freshman record. For the 2005 season, Bard was named preseason first-team All-America by Baseball America and was named preseason third-team All-America by Collegiate Baseball and by the National Collegiate Baseball Writers Association. Bard went 7–5 with a 4.22 ERA in 16 starts and was third in the ACC in opponents' batting average at .219. He was named to the Roger Clemens Award Watch List. Bard was a second-team summer All-American selection in 2005 Cape Cod League after a successful summer with the Wareham Gatemen, where he led the league in innings pitched and strikeouts while finishing 3rd in ERA. Bard and fellow North Carolina left-hander Andrew Miller were rated the top two prospects in the Cape Cod League. Danny Bard and Miller led the UNC to the College World Series, but lost to Oregon State, two games to one. He finished his junior year with a 9–4 record and a 3.64 ERA in 17 starts. He earned ACC pitcher of the week honors twice during the 2006 season. On June 6, 2006, Bard was selected in the first round (28th overall) of the 2006 Major League Baseball Draft by the Boston Red Sox. On September 4, Bard signed with the team. Bard admitted he had enrolled in classes at UNC as a backup plan in case a deal with the Red Sox was not finalized in time. Bard had been previously selected in the 20th round with the 604th overall selection out of high school by the New York Yankees in the 2003 Major League Baseball Draft, but did not sign. Drafted as a starting pitcher, Bard spent the 2007 season in the same role starting all 22 of his appearances with the Greenville Drive and Lancaster Jethawks. Unfortunately for Bard, the results were disastrous: He posted a 7.05 ERA between the two levels, and walked 78 batters in 75⅓ innings pitched. Because of the poor success starting, at the end of the 2007 season he was moved into the bullpen to pitch as a reliever. While pitching out of the bullpen in winter ball in Hawaii, Bard put up a 1.08 ERA in 16 appearances. Though control was still an issue, there was large improvement. Remaining in the bullpen, Bard split time between the Greenville Drive and Portland Sea Dogs. He posted a 1.51 ERA and had 107 strikeouts in 77⅔ innings of work, and was named the Boston Red Sox 2008 Minor League Pitcher of the Year. Bard began the season at AAA Pawtucket. He faced 58 batters in 16 innings, giving up six hits and striking out 29. Of those six hits, two were home runs. On May 10, 2009, the Red Sox designated pitcher Javier López for assignment, and called Bard up from the Triple-A Pawtucket Red Sox. On May 13, 2009, he made his major-league debut against the Los Angeles Angels of Anaheim pitching two scoreless innings in an 8–4 loss. Bard made his debut at Fenway Park on May 20, against the Toronto Blue Jays in the 8th inning. He gave up two hits on the first two pitches thrown, eventually giving up a run. He pitched ⅔ of an inning before being replaced by left-hander Hideki Okajima after the second out, leaving two runners on base. Bard recorded his first career save in the 13th inning of a 5–2 victory against the Philadelphia Phillies. Although he gave up a walk and hit a batter, Bard managed to strike out the side to clinch the save. Bard recorded his first major league win on August 26, against the Chicago White Sox after pitching a scoreless inning and a third in the eight and ninth followed by a walk off home run by David Ortiz. Bard was a post-season correspondent for ESPN. Bard was the primary setup man in the bullpen once again. He appeared in 73 games, posted an impressive 1.93 ERA and 1.00 WHIP on the season with 76 strikeouts. Bard set the club record with 25 consecutive scoreless appearances, running from May 27 to July 31. The previous record was held by Ugueth Urbina. Bard's season, like that of his team, came to a crushing end. After dazzling for most of 2011, Bard had a terrible last month of the year: "He finished September 0–4 with a 10.64 ERA, issuing more walks (nine) than he had in the previous three months combined (eight). Based on win probability added (WPA), the player most responsible for Boston's collapse was Bard." The Red Sox made Bard a starting pitcher for 2012. He started the season 5–6 with a 5.24 ERA, striking out 34 while walking 37 and hitting eight batters. On June 5, 2012, Bard was optioned to AAA Pawtucket. In his last start prior to his demotion, he lasted 1.2 innings against the Toronto Blue Jays, giving up five runs, six walks, and hitting two batters. Bard continued to struggle in AAA, surrendering 15 walks and posting a 7.08 ERA in 20⅓ innings through the end of July. Bard was recalled on August 30 when Zach Stewart was optioned out. Bard started the 2013 season in the team's Double-A affiliate in Portland. He was recalled on April 23. On April 28, he was optioned back to Portland to make room for returning reliever Joel Hanrahan. He was designated for assignment on September 1. On September 4, 2013 Bard was claimed off waivers by the Cubs from the Red Sox. He became a free agent on December 2, 2013 after being non-tendered by the Cubs. On January 31, 2014, Bard signed with the Texas Rangers. He inexplicably lost command of his pitches, walking nine and hitting seven batters while recording two outs in a stint for the Rangers' Single-A club. On June 19, 2014, Bard was released by the Rangers. The Chicago Cubs signed Bard to a minor-league deal on January 18, 2015. On January 11, 2016, Bard signed a minor league deal with the Pittsburgh Pirates. On May 13, 2016, Bard was released by the Pirates. After failing to make a minor league appearance, Bard was released on May 14, 2016. On June 6, 2016, Bard signed a minor league deal with the St. Louis Cardinals. He was released on May 18, 2017. On June 11, 2017, Bard signed a minor league deal with the New York Mets. He was then hired by the Arizona Diamondbacks on February 1, 2018 to serve as a franchise player mentor. Bard threw four pitches. About half of his pitches thrown were four-seam fastballs in the range of 92–96 mph. He also featured a two-seam fastball (93–97), slider (79–83), and changeup (86–89). Bard's changeup was used almost exclusively against left-handed hitters. He used the slider against lefties as well, but much more so against right-handers. Bard's velocity on all of his pitch types dipped several miles per hour in 2012, presumably as a result of his conversion from a relief pitcher to a starter. Bard said he was mildly surprised, but not alarmed by the drop: "I knew there’d be somewhat of a drop-off, velocity-wise, when I went to starting. I didn’t think it would be quite this big ... When I’m 93, 94, they’re just as late as they were on that 97. I think it’s the way I’ve been able to set it up. If I can just establish strike one a little more consistently, the velocity can be whatever it wants to be." His brother, Luke, played college baseball at Georgia Tech and was drafted by the Minnesota Twins in the first round of the 2012 Major League Baseball Draft. Luke Bard made his major league debut for the Los Angeles Angels on March 31, 2018. His cousin, John Andreoli, is also a professional baseball player. ^ Benjamin, Amalie (May 9, 2008). "Bard pens a comeback story". The Boston Globe. ^ Speier, Alex (July 20, 2011). "Miller, Ellsbury help Sox cook O's". WEEI. Retrieved May 23, 2012. ^ Lundblad, Jeremy (September 29, 2011). "Boston Red Sox ugly September shows by the numbers". ESPN.com. Retrieved May 23, 2012. ^ "Daniel Bard Minor League Statistics & History - Baseball-Reference.com". Baseball-Reference.com. Retrieved July 25, 2012. ^ Bradford, Rob (April 28, 2013). "Daniel Bard headed back to minors to make room for Joel Hanrahan". WEEI-FM. Retrieved April 28, 2013. ^ "Daniel Bard claimed off waivers by Chicago Cubs". ESPN. September 6, 2013. Retrieved November 6, 2013. ^ Durrett, Richard (January 31, 2014). "Rangers near deal with Daniel Bard". ESPN.com. Retrieved January 31, 2014. ^ Speier, Alex (March 14, 2016). "After losing control, Daniel Bard regains it". The Boston Globe. Retrieved June 7, 2016. ^ Fraley, Gerry (June 19, 2014). "Texas Rangers release Daniel Bard". The Dallas Morning News. Archived from the original on June 21, 2014. ^ Brink, Bill (January 11, 2016). "Pirates sign Daniel Bard to minor league contract". Pittsburgh Post-Gazette. ^ MCaffrey, Jen (June 6, 2016). "St. Louis Cardinals sign former Red Sox pitcher Daniel Bard to minor-league deal". MassLive.com. Retrieved June 7, 2016. 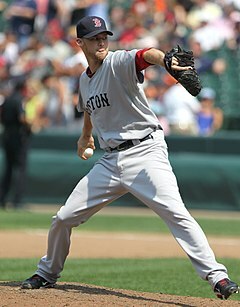 ^ Daniel Bard, ex-Boston Red Sox RHP, joins Diamondbacks as player mentor; Jonny Gomes to be rookie ball hitting coach. Retrieved April 2, 2018. ^ "Brooks Baseball · Home of the PitchFX Tool - Player Card: Daniel Bard". Brooks Baseball. Retrieved May 23, 2012. ^ Lauber, Scott (May 19, 2012). "Where has Danny Bard's fastball gone? — plus, links". Boston Herald. Retrieved May 23, 2012. ^ "Luke Bard Minor League Statistics & History". Baseball-Reference.com. 2017. Retrieved January 5, 2018. ^ "Shrewsbury's Andreoli hot at the plate and on the bases for the Daytona Cubs". The Boston Globe. July 11, 2012. Retrieved January 30, 2017. Wikimedia Commons has media related to Daniel Bard.